Do you know what ‘MUDRA’ bank is? 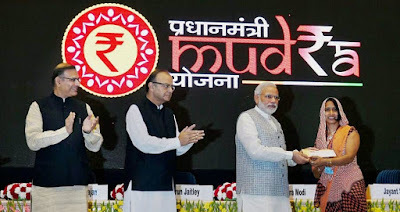 The Prime Minister Narendra Modi has launched the Micro Units Development and Refinance Agency Ltd (MUDRA) bank on 8th April, 2015 with an amount of Rs 20,000 crore and credit guarantee amount of Rs 3000 crore. Let’s know something more about the Mudra Bank. How MUDRA bank is useful to the Financial System? Update on 22nd September, 2015. Q:- How many people has took benefits under Pradhan Mantri Mudra Yojana? A :- Total of 37 lakh people have been disbursed loans around Rs. around 24,000 crore through Government banks under PM Mudra Bank Yojana. Government Banks to disburse Rs 1.22 lakh crore under PM Mudra Bank Yojana by end of this fiscal year, Said Finance Minister Arun Jaitley. 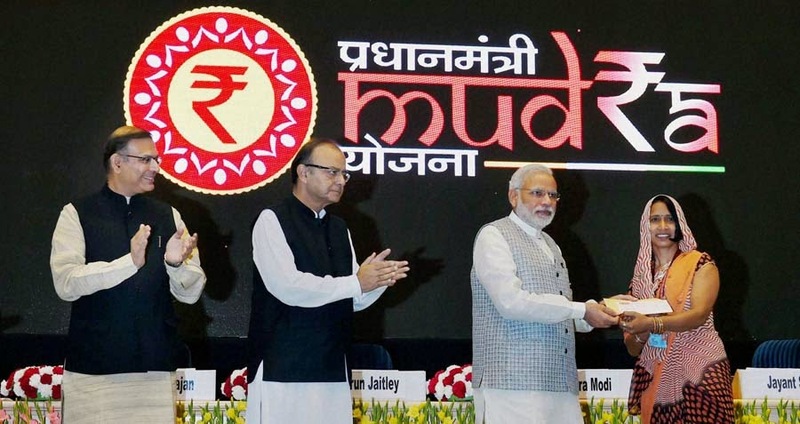 Government has announced nationwide campaign to spread awareness about Pradhan Mantri Mudra Yojana. As 5.77 crore small business units generate almost 11 crore jobs. Well, the individuals who live in rural and interior part of India are mostly eliminated from the advantages of formal banking system. As a result, they never had right to get insurance, loans, credit, and other financial services to set up their small businesses. Therefore, they mostly depend on the local money lenders for recognition. So the Prime Minister has introduced MUDRA bank to help all of them in growing their businesses and success. ⦁ Expand the finance and credit support to MFI (Microfinance Institutions) and organizations that loan money to small businesses, individuals, self-help groups, and retailers. ⦁ Regulate the lender and the borrower of MIF and carry steadiness to the microfinance system via guideline and comprehensive contribution. ⦁ Give prearranged instructions for the borrowers to follow and evade failure of business or take right steps in time. MUDRA bank will assist to lay down instructions or suitable procedures to be followed by the lenders to recover money in cases of failure to pay. ⦁ Generate the standardized agreements that will form the back of the last-mile business in future. ⦁ Moreover, register all Microfinance Institutes and initiate a system of performance rating and authorization for the first time. It will help last-mile borrowers of finance to evaluate and approach the MFI which meets their conditions and whose past record is acceptable. Due to this a competitive element will introduced among the MFIs. ⦁ Provide a credit guarantee scheme for giving guarantees to loans which are presented to micro businesses. ⦁ Establish apposite technologies to help in the process of resourceful lending, borrowing, and monitoring of circulated capital. MUDRA bank has categorized the borrowers into three sections named “the starters”, “the mid-stage finance seekers”, and “the next level growth seekers”. These are the facilities which will be provided by MUDRA bank in future. Well, MUDRA bank will help Micro finance Institutions for their great growth in business and as well as success! Prime Minister Narendra Modi has planned so well for the India’s small businesses that are not able to get advantages of latest technology and other financial help from bank. It will surely help the financial system to enhance! For any query or question, you can contact at help@mudra.org.in (email them) and get instant help. Click here to get the complete details of mudra bank nodal officer. Click here to know procedure for how to get Loan from Mudra Bank >>.